The entry to an EchoPark store outside Denver looks more park than parking lot. DENVER -- Marti Eulberg likes what she sees on social media reviews of EchoPark, Sonic Automotive Inc.'s used-only car dealership. "If you look at any of the reviews that are on social media, it's all about the experience, which is ultimately what we're trying to deliver." Sonic opened its first EchoPark store here seven months ago and followed it with two satellite stores, also in the Denver area. 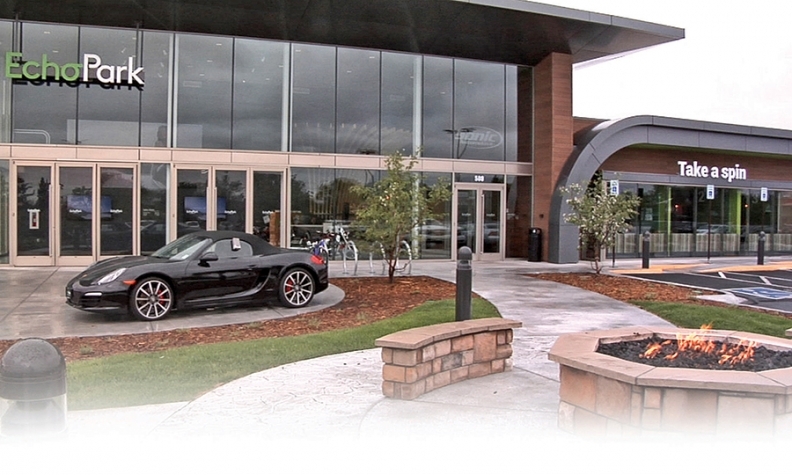 The dealership group aims to eventually have EchoPark stores in more than 50 markets nationwide. So far, the stores are meeting Sonic's expectations. The group's leaders declined to give financial specifics, but they said the stores are profitable in sales and finance and insurance and are building customer-pay service revenue. Eulberg led the development of EchoPark. 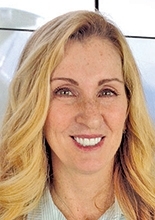 She is a former CEO of Maserati North America who also has worked in sales and marketing for Volvo in both North America and Europe and for BMW and Jaguar in North America. She joined Sonic in 2012. Over 18 months, she traveled 15,000 miles and shot 160 hours of video, visiting various retail stores, high-end hotels and rival dealerships, including the nation's largest used-car retailer: CarMax Inc., which has two stores in the Denver market and will open two more there in mid-June. She adopted best practices from all of them for EchoPark. The EchoPark store in the Denver suburb of Thornton sits off a highway, set amid retail shops and restaurants, not in an auto mall. It is smaller than the typical CarMax store. That's deliberate. While a hub EchoPark store such as the one in Thornton needs to be large enough to include a service operation that can recondition vehicles, satellite stores are designed to have even smaller footprints so they can be located in neighborhoods. Sonic wants EchoPark to feel luxurious and comfortable. A stone-lined fire pit, similar to what one might find at a ski lodge, sits outside the entrance, in what looks more like a park than a dealership parking lot. Inside, a receptionist greets visitors in front of a softly lit, open-floor showroom surrounded by big windows. Wi-Fi is available throughout. 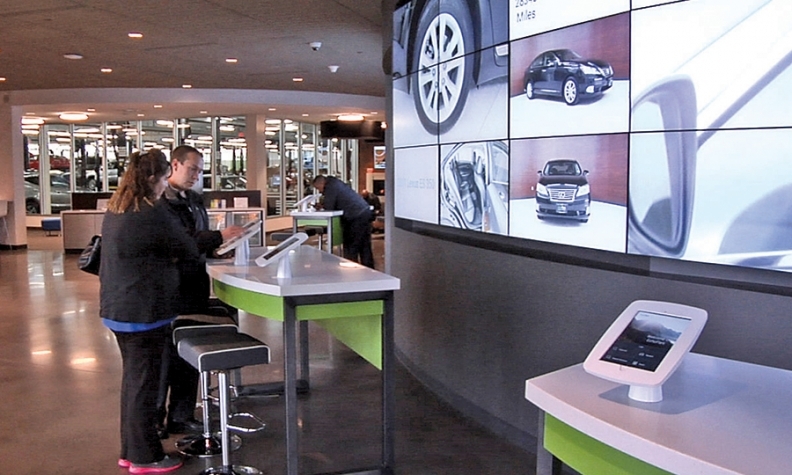 There are no cars in the showroom, no salespeople ready to pounce, no cubicles or desks. Instead, there are seven "open consultation" stations with soft, sofalike seating and tables. Four of them resemble restaurant booths. Toward the back of the store, a fireplace and seating area near a window look into the service department. It offers a microphone station -- dubbed "How'd you do that?" -- where customers, or guests, as EchoPark calls them, can talk to service technicians as they work. EchoPark's service area posts all its prices, and its competitors', on large boards behind the service advisers' desk. "There are no hidden fees anywhere," said Jeff Matthews, executive general manager for EchoPark. "It's our hourly rate times however many hours it takes to do the job." Looming high above the showroom is a giant screen on the wall called an Imagine Bar. There, the customer uses an iPad to search EchoPark's inventory by brand, model or other criteria. The customer can launch the car's image and information onto the big screen for better viewing. If the customer wants help, a tap on the iPad and a green light on the screen signals a salesperson, or Experience Guide in EchoPark parlance. Shoppers can view inventory on a giant screen dubbed the Imagine Bar. As at CarMax, customers at EchoPark work with one person -- who is paid a salary, not a commission -- throughout the one-price, no-haggling transaction. EchoPark's salespeople are different from those at a typical dealership, Matthews said. Because the entire transaction is done using an iPad, he had to hire people comfortable with technology, yet with strong customer service skills. About 100 people work at the Thornton store. Many came from backgrounds such as Nordstrom department stores, T-Mobile and other "wireless industries," he said. The hiring was "painstaking," weeding through "thousands of applicants," Matthews said. But the turnover rate has been just 16 percent. Many in the core group are being trained to move into higher positions in the next two EchoPark stores Sonic will open in the Denver area by year end, Matthews said. Matthews said the employees' experience is just as important as the customers'. There are two spacious employee lounges. Both have large windows, vending machines, kitchens, tables and comfortable seating areas. The salary-based pay plan attracts younger, educated workers. Letting them handle the entire transaction is empowering, Matthews said, resulting in better customer service. "In a traditional world, managers manage car deals. In this world, we want them to manage, develop and train people," Matthews said. "If you work at Starbucks, they don't pay you for pushing an extra latte. They pay you to deliver a great experience." Brittany Small sold jewelry before joining EchoPark in November. EchoPark's uniqueness attracted her to the job, she said. "We're not a hard-sale dealership. We take the guests through the process, from the beginning to the end," Small said. 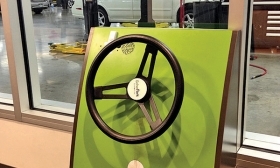 A microphone station allows customers to talk with service techs as they work. The salesperson even does the trade-in quote at the Quote Me station, an enclosed garage set off to the side of the showroom. The trade-in value is assigned by Sonic's retail trade center in Charlotte, N.C. Getting it takes 10 to 25 minutes. "It's an interactive process where the customer sees all the third-party data," said Matthews. "We've got nothing to hide." EchoPark's three stores today stock about 670 used vehicles, vs. a capacity of 700. Matthews said about 30 percent of that inventory came from people who sold their vehicle to the store without buying one. He'd like to raise that to 65 to 70 percent. The stores are still prototypes, Eulberg said, so she monitors feedback to look for ways to improve. "If we think we got it right, we didn't, because you always have to keep going," Eulberg said. "If you think about your shopping experience, everywhere you go, it continues to elevate."